An Ariane 5 ascends from French Guiana at sunset with the EchoStar 17 and MSG-3 satellite payloads into orbit from Guiana Space Center in Kourou, French Guiana. Liftoff occurred on July 5, 2012. A European-built rocket roared into space from South America Thursday (July 5) carrying two new satellites on very different missions. The unmanned Ariane 5 rocket blasted off from a pad at the Guiana Space Center in Kourou, French Guiana, to send an American communication satellite and European weather-monitoring spacecraft into orbit. Liftoff occurred at 5:36 p.m. EDT (2136 GMT). Riding the heavy-lift Ariane 5 rocket into space were the communications satellite EchoStar 17, built for the U.S. company Hughes Network Systems, and Europe's third Meteosat Second Generation weather satellite, which is also known as MSG-3. The satellites' launch was managed by European rocket provider Arianespace, builder of the Ariane 5 booster. "By orbiting these two satellites, we have once again demonstrated the flexibility of Ariane 5 – which was capable of simultaneously launching one of the largest telecommunications satellites ever built for an American private operator, along with one of the most capable meteorological satellites developed for a European government organization," Arianespace Chairman & CEO Jean-Yves Le Gall said in a statement after the launch. The MSG-3 spacecraft is the latest weather satellite to join Europe's Meteosat fleet in space. The 4,409-pound (2,000-kilogram) satellite is designed to provide high-resolution images of Europe, Africa and the North Atlantic to help meteorologist generate more accurate weather forecasts. The satellite is currently being controlled by the European Space Agency's (ESA) operations center in Darmstadt, Germany. But after a testing period to ensure the satellite is operating properly, control of the MSG-3 spacecraft will be turned over to its owners: the European Organisation for the Exploitation of Meteorological Satellites (EUMETSAT), ESA officials said. Once that handover occurs, the satellite will be rechristened Meteosat-10, they added. "Tonight's launch allows EUMETSAT and ESA to continue providing Europeans with high quality observations of weather from space, with MSG-3 being especially valuable in rapid detection and warning of extreme weather situations," ESA Director General Jean-Jacques Dordain said in a statement. ESA has been working together with EUMETSAT to develop the Meteosat weather-monitoring satellites, as well as another Earth-observing system known as polar-orbiting MetOp. The two agencies are also working on a more advanced Meteosat system, the Meteosat Third Generation, to advance weather forecasting efforts even more, ESA officials said. "Once operational at the end of this decade, this next generation will provide a quantum leap in terms of technology and performance, providing among others faster imaging, more spectral channels and an atmospheric sounding capability allowing for the measurements of trace gas profiles," said Volker Leibig, director of ESA's Earth observation program. ESA and Eumetsat are also planning a new generation of polar-orbiting MetOp satellites (the MetOp Second Generation), which is due to be presented for review to ESA's governing council in November. Meanwhile, the next of the first-generation MetOp satellites to fly will launch on Sept. 19, ESA officials said. 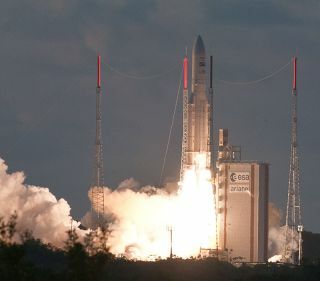 Thursday's liftoff marked the third Ariane 5 rocket launch of the year. Arianespace plans to launch its next mission on Aug. 2 to send the Intelsat 20 communications satellite into orbit.